Communication, an informed membership, and an active membership committee are keys to the success of an organization. AFSA fulfills these critical functions by distributing information through its AFSA Magazine, legislative bulletins, newsletters, and other publications. AFSA Magazine is AFSA’s premier publication and is used to inform members, congressional representatives, Department of Defense and Veterans Administration officials, and the public about the issues, topics, events, and actions affecting Air Force enlisted members and their families. AFSA Magazine is the only magazine dedicated solely to Air Force Active Duty, Air National Guard, and Air Force Reserve Command enlisted members—active duty, retired, and veteran—and their families. 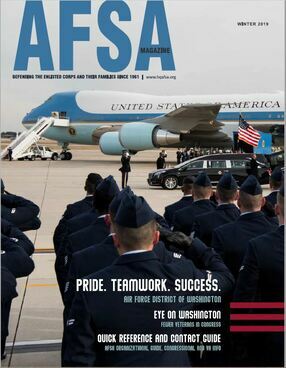 AFSA Magazine reports on AFSA’s legislative efforts; Air Force, VA and DoD news; AFSA member activities; and other special features to let readers know what our Airmen, of yesterday and today, did and continue to do to keep our nation safe and ensure our democratic way of life. The AFSA Magazine published six times this fiscal year. The special Enlisted Almanac Winter edition, provided up-to-date information on base and AFSA Chapter locations; military pay and compensation; Air Force structure and end strength; and active duty, reserve components, retiree, and veteran entitlements. Supplemented with charts and graphs, the annual Enlisted Almanac brings an understanding and perspective that no other magazine can match. The 2016 Spring AFSA Annual Report issue focused on suicide prevention education and crisis support resources. The Summer issue honored POW/MIA families, and our continued quest to recover those still missing. The Annual Fall AFSA International Convention issue highlighted the overall event, special guests and our programs to recognize and award excellence. EMAIL: Each quarterly/seasonal edition of the AFSA Magazine is emailed to all members using their email of record. To ensure you receive the AFSA eMagazine, please update your current membership information to include your PERSONAL (not. mil) email address. SUBSCRIPTION BY MAIL: Beginning with the Winter 2019 edition, the AFSA Magazine is once again available as a printed and mailed Subscription. Subscription rates are: $20 annually for members and $28 for non-members. Individual copies of each magazine are also available at $7 each. Please visit the Magazine Subscription page to enroll on-line for this service. AFSA’s publications provide an important link between AFSA International and its members. The e-News is a monthly electronic newsletter that presents information about membership benefits, current campaigns, and thoughts from the executive Council and Headquarters staff. As-it’s-happening information releases via the social media service. When AFSA staff members are in the room on Capitol Hill and are permitted to use smartphones, they’ll report live. Follow us @AFSAHQ. The AFSA Facebook is managed by HQ AFSA, and provides information to members in a way that can be engaged, shared, and commented on. To be part of the conversation, like AFSA on Facebook. news sources that may be of interest to our members. choose the articles they want to see in full. as-is to their elected officials. To subscribe to this service, visit the Legislative Action Center. latest AFSA advocacy or survey campaigns.